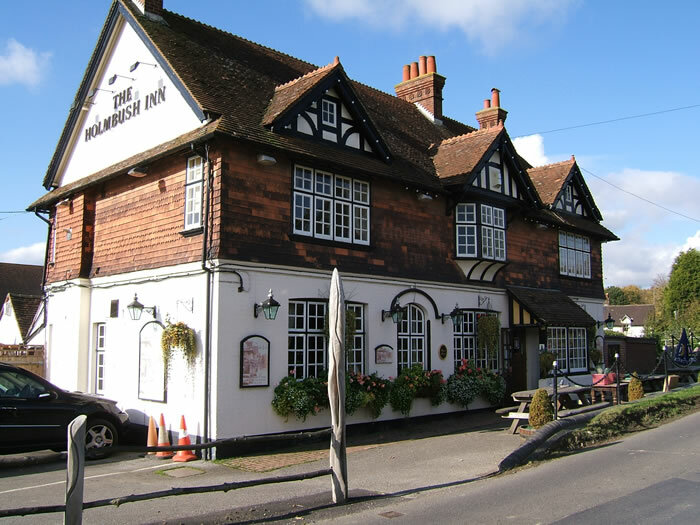 The Holmbush Inn is a friendly, family-run pub with wooden floors, exposed brick walls and two fireplaces. There is a restaurant/dining area at one end of the bar and several comfy sofas at the other end. Beers include Fullers London Pride and usually at least one local ale. The pub is known for its traditional, home-cooked menu [Mum's Specials!]. There is a garden to one side of the pub, parking on the other side, and there is easy access to Faygate railway station [trains from Horsham]. The pub is open all day on Friday and Saturday but closed on Sunday evening. There are some quiet roads between Faygate and Rusper. Come out of the pub and turn left along Faygate Lane. Rusper is 2 miles [3.5 km] from Faygate in a direct route but there is also a circle of quiet country lanes between Faygate, Lambs Green and Rusper. Cycle back to Horsham via Rusper, Friday Street and Langhurstwood Road. or St Leonard's Forest near Colgate has some good off-road bridleways and tracks. Nearby pubs include the Lamb Inn at Lambs Green. Rusper has the Plough and the Star Inn.